Danny O’Brien hopes Second Bullet can follow a similar path to his Adelaide Cup winner Demerger when he steps out in Saturday’s Lord Reims Stakes at Morphettville. Demerger ran second to Far Lane in the 2005 version of the Lord Reims, the Carlton Draught Stakes, before hoisting aloft the Cup trophy nine days later when she bolted in by almost seven lengths. “It’ll be a race that’ll tell the tale for the Adelaide Cup ... it usually does,” O’Brien said. Second Bullet is the clear-cut $2.80 favourite with UBET to go one better than Demerger and win Saturday’s $120,000 Group 3 Lord Reims Stakes (2600m), despite finishing sixth as favourite in the Mornington Cup Prelude over 2000m at Caulfield last weekend. The six-year-old gelding was a dominant winner first-up over 1800m at Caulfield three weeks ago and O’Brien thinks that race may be a more accurate pointer to his prospects on Saturday. Second Bullet has drawn the inside barrier with Daniel Moor in the saddle, his chances boosted further when Tony McEvoy opted to scratch quality stayer Big Memory from the Lord Reims and instead run in the Roy Higgins Quality (2600m) at Flemington. “I thought Second Bullet was just a victim of circumstances last week. It was very slowly run,” the Melbourne trainer said. “His first-up race was run at a very solid pace and he really enjoyed that and won very well. “But there was no speed last time and he was left flat-footed. It was basically a 2000m barrier trial. “He’s on trial on Saturday to run in the Adelaide Cup. 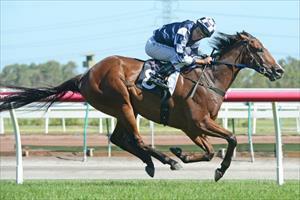 “He hasn’t been beyond 2600m but he stayed on well in the Bendigo Cup (2400m) and the Queen Elizabeth (2600m). Following the scratching of Big Memory, the Darren Weir-trained Master Of Arts is rated the $3.50 second favourite, with local hope Mail It In on the next line of betting at $4.80. O’Brien also has De Little Engine and Shampion nominated for the $400,000 UBET Adelaide Cup on March 13 and said there was some chance all three horses could contest the 3200m staying feature. The first three placegetters in the Lord Reims are exempt from ballot from the Adelaide Cup and not liable for a re-handicap. Meanwhile, Thoroughbred Racing SA on Friday announced a change to the rail position for Saturday’s program after a sprinkler burst near the 1650m mark. The rail now will be out four metres from the 1800m to the 1200m to avoid the affected area.